Facebook has just announced that tonight they will begin rolling out their new App Center to certain people in the United States, with availability for everyone else to be expected within the coming weeks. The App Center gives you personalized recommendation and allows you to browse the apps your friends are already using. User feedback keeps the Center stocked with only positively-rated product. You can send apps you find on your computer to your mobile device using the new "Send to Mobile" feature. If a mobile app requires a download, you'll be sent to install it from the Apple App Store or Google Play. 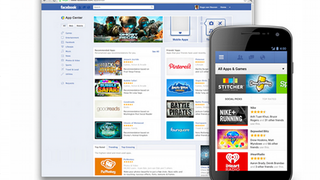 A "Send to Mobile" feature allows you to send apps you've found on your computer straight to your smartphone; it is fully integrated with both the Facebook iOS and Android apps, as well as Facebook.com. And mobile apps requiring a download can be installed from either the Apple App Store or Google Play. Before installing one of the App Center's 600 apps, users will be able to read a detailed description and see a screenshot of the app in action. It was also tell you what kind of personal information is needed for a given app to run and allow users to customize and control the visibility of their app activity.